This stir fry i made a few days ago when some unexpected guests arrived on a short notice, i made this as a side dish and though it was a big kadhai full of this I did not click a single picture because it was not on my mind. I realized when i was asked for the recipe and whether it is already on the blog, so when i was keeping the leftovers in the fridge i thought of taking a picture and the leftover bowl of the yummy cabbage stir fry comes to you...............sorry !!! 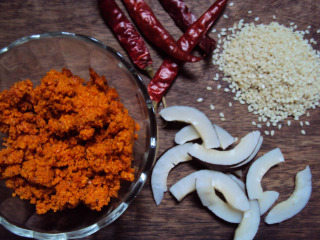 Microwave the sesame seeds for a minute, add the coconut slices and microwave for another 30 sec, add the red chillies and microwave for just 5 seconds (otherwise you will end up sneezing uncontrollably)..
Alternatively dry roast everything in pan while tossing constantly till aromatic and the sesame seeds start popping. Cool the mixture and grind together to make a powder, i call it a paste because the oi content of sesame n coconut make it a pasty powder........keep aside. 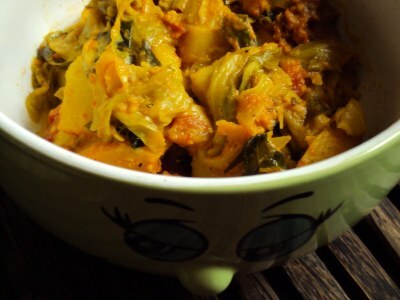 Chop the cabbage in large chunks, chop the tomatoes in large chunks too. Heat oil in a wide pan and throw in the cumin seeds and wait till they splutter, throw in the curry patta and fry them for a couple of seconds. Add the tomatoes and the salt add keep covered till the tomatoes are soft, open the lid and thrash the tomatoes to make them slushy. 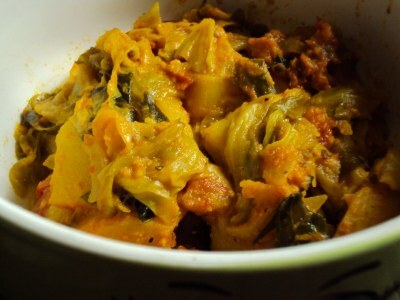 Add the cabbage and mix well, stir and cook for a while till the cabbage gets softer and reduces in volume. add the sesame powder and keep stirring to mix and to separate the leaves of the cabbage .......the stir fry looks beautiful with curled up cabbage chunks coated with a red saucy masala ....no need to add water as the cabbage releases enough water to make the powder saucy and gets coated. Serve hot as a side dish or just with chapatis as we had the leftovers ...a good filling for a sandwich too. Looks very tempting. I haven't ever made this version before. Looking great! this really sounds awesome! bookmarked! 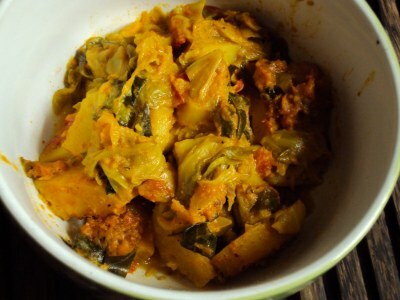 My mouth is watering at this curry cabbage. Thanks Priya for the lovely words on your blog and for a great feedback..